A French friend cooked this dish for me and another friend and I absolutely loved it (I helped myself to 3 plates… :P). Peel and finely chop the garlic, ginger and onion. Peel the carrot and then cut it into small cubes. Heat the oil in a frying pan, fry the onion translucent, then add the garlic, ginger and carrot. Stir well and cook for 5 minutes, stirring occasionally. Add the turmeric, garam masala and paprika powder, stir well, cook for 1 minute, make sure it doesn’t burn. Add the lentils, coconut milk, water and tomatoes. Bring to the boil, then reduce the heat. Simmer covered for 30-45 minutes, stir occasionally (if you’re in a hurry, I think 10-20 minutes will do – when I cook red lentils they’re often ready after only 5 minutes… 😉 ). Season with lemon juice, salt and black pepper and cook for another fifteen minutes. Garnish with fresh coriander or toasted almond slices. 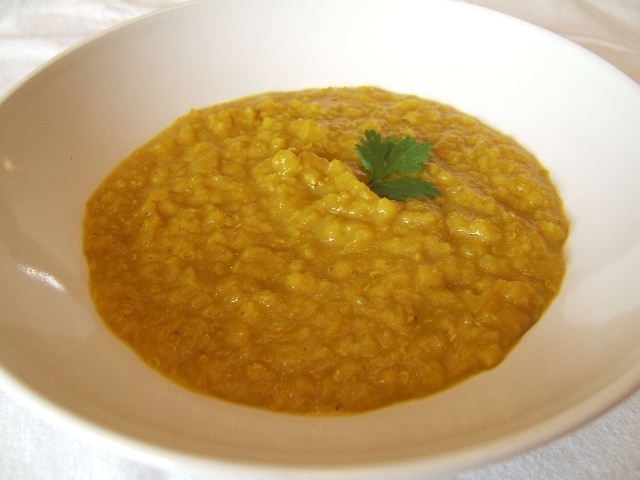 This entry was posted on 13/01/2012 by G in Cultures, Recipes and tagged coconut, dish, Hindi, India, lentils, mains, recipe, spices, vegan, vegetarian.